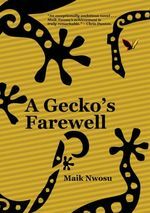 A Gecko’s Farewell centres on three Africans from different parts of the continent who meet “in the spirit” (online) and plan to found a School of Stories. Etiaba is a village schoolteacher. When he loses his job, he moves to the capital city—and its world of prayer contractors and hope merchants. Mzilikazi’s is the story of “the homeless specter, the boy soldier, the fugitive, the exile”—the story of a black South African dislocated under the Apartheid regime. Nadia is a radical student of photography at the American University in Cairo. She becomes a photojournalist and takes the picture of an Islamist terrorist, an act that endangers her. These three characters eventually ‘escape’ from Africa, but Africa is in a sense inescapable. They ‘meet’ at an online forum and forge a therapeutic friendship, but their coming together also embeds the seeds of their eventual separation.